What do employers want in a job candidate? While students often graduate with a diploma, certificate, or some other physical proof of their academic accomplishments, there’s another takeaway that motivates students to further their education: confidence! Here's how Penn Foster helps students become more confident in their academic and professional lives. As we celebrate 125 years of Penn Foster, we find ourselves poised to reach an incredible milestone. 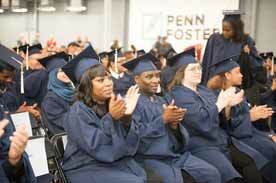 Learn how you can help us make history by becoming a member of Penn Foster High School's largest graduating class ever! In the first of our five part series of resources to help your student journey, we look at Time Management tools. From apps for your smartphone to working directly with fellow students, we cover a number of options. There have been many milestones in our 125 years and a few of them took place recently with our 2014 panel at SXSWedu. Penn Foster continues our 125th year anniversary celebration with a story from our own employee, Kris Boylan. She recounts her experience joining Penn Foster and her 20 years of service.